Growing tomatoes in Central Russia – the process of region of risky agriculture. Time to ditch the lot, and the result will be zero. Therefore, not all gardeners grow tomatoes. But if someone manages to grow them, and even remove red Bush, a man among colleagues will honor and respect. Scientists have long answered the question of which tomato is healthier – those that ripen on the Bush, or those that ripen in the pantry. Definitely in shot of ripe fruits more biologically active substances such as lycopene or carotene, more vitamins, but they are much tastier. But what if the warm summer time is so short that tomatoes just do not have time to ripen? Only one thing is not to leave plants alone with nature. Otherwise, your tomatoes will never ripen before the cold weather, and then most of them will not blush and turn black from blight. In the first week of August starts, so-called cold dew. From this point it is impossible to keep the bushes open at night, otherwise they will get sick by late blight. Be sure to put over the ridge of the arc and stretch film. After the ovaries tomatoes 30 days to grow and another 15-20 days to Mature. A very good way to stimulate the maturation - to cut the bushes on the lower leaves. Take one every three days, each Bush one by one bottom sheet so that by the time the fruits reached maximum size, under the brush there is not one sheet. The same should be done by other hands, which began to fruit. Helps to ripen tomatoes, aqueous solution of iodine. Ten liters of dilute 30-40 drops and pour this solution in a 1.5 meter beds. It is noticed that the ripening of tomatoes is more intense on depleted soil. Therefore, time of fruiting, you need to stop watering and feeding, otherwise, to the detriment of the business will grow only green mass. In addition, after the fruit is poured, it is necessary to limit the availability to them of moisture and nutrients. This makes the stem through holes 7-10 cm long, into which insert spacers in the form of wood chips to the stems are not meshed. If the summer was without much heat, then after fruit set it is possible to open the greenhouses for about two hours for ventilation, and the rest of the let it be film. Heat, which is formed there will be tomatoes only benefit. Tomato bushes have to be strong, with bright green leaves. If the seedlings are stretched, then from such planting material the farmer will get less yield than could be. Simple techniques will help to prevent this. 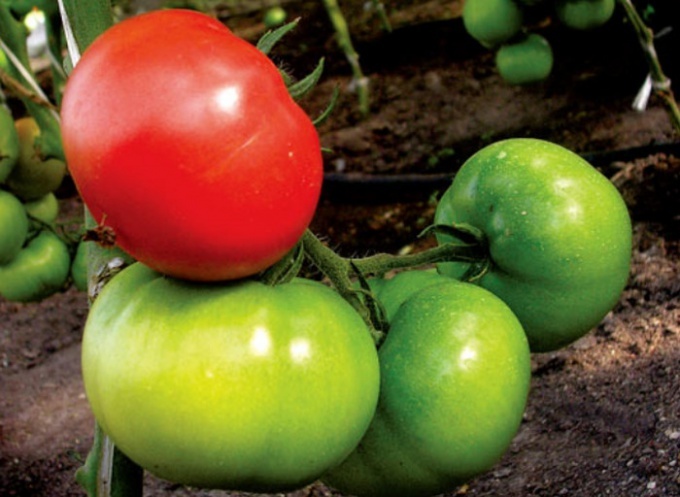 To slow the growth of tomatoes, you need to choose the right light and temperature conditions. There is a great importance and technology of irrigation. There are other ways to achieve this. If the room is too warm, it is one of the factors pulling seedlings. Usually it happens when the plants are on the kitchen windowsill. Put bowls with young bushes in a cool room where the temperature during the day +20+22, and at night – +15+17 o C. Spend airing. Especially important is the cultivation of seedlings at low temperatures, if the seeding was made earlier – in late January-early February. This technique enables to obtain strong seedlings and an early harvest. When you pull the tomatoes in the greenhouse you want it to reduce the temperature. With the help of daytime ventilation. Nitrogen fertilizers promote the growth of tomato. If the plants leaves are rich green in color, and the bushes stretched, reduce nitrogen fertilization. In February-March is still a little light day. This is one of the reasons for pulling tomato. To avoid this, turn on the lamp for supplementary lighting in the evening and morning hours and on cloudy days. Put reflective screens behind the plants, then part of the light will fall on the back side of the plants, and they will not be much stretch. Proper watering will also help to cope with this problem. If the tomatoes are growing strong, stocky, watering can be more frequent. If the distances in the interstices is increased, it will reduce the glaze. It should only slightly moisten the soil a small amount of water. When this problem disappears, it is possible to shed all earthen layer. This procedure will help to expend power plants on the formation of additional roots and survival rate, so at that time the growth of the tomato will slow down. 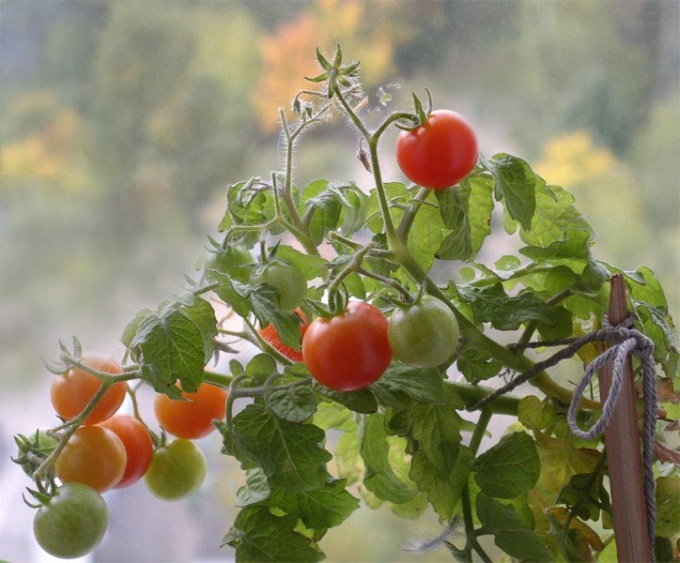 Seedling tomatoes, unlike the cucumber, has a high percentage survival rate. So she likes swordplay. If you've planted the seeds, then transplant the young tomatoes, not once but 2 times. The first pick is made when the shoots will have 2-3 true leaves. Before this should not be done. The second time, you can make picks 20-30 days after the first. Gardener you'll see that the tomatoes are pulled and transplanted young plant from a small pot into a big one. Often the sky grown seedlings, while in April-may, its hold on the glazed balcony. On Sunny days the air temperature is very high. So you need to hang on glass light curtains and keep them open. The issue of accelerating the ripening of tomatoes is of concern to many gardeners. Especially nice to gather with branches already red flavorful fruit. To achieve this, we need, first and foremost, learn to properly shape plants. The formation of tomatoes includes, mainly, remove side shoots and pinching. Since tomatoes are much branched, forming in each kidney, located in the leaf axils, lateral escape, it is advisable to remove, that is, conduct side-shoot removing. If this procedure is not done, then soon all side shoots will appear floral brushes. This will slow down the growth and development of the whole plant and, accordingly, the ripening of fruits. Side-shoot removing triggers not only accelerated the ripening of tomatoes, but also increases the first harvest. 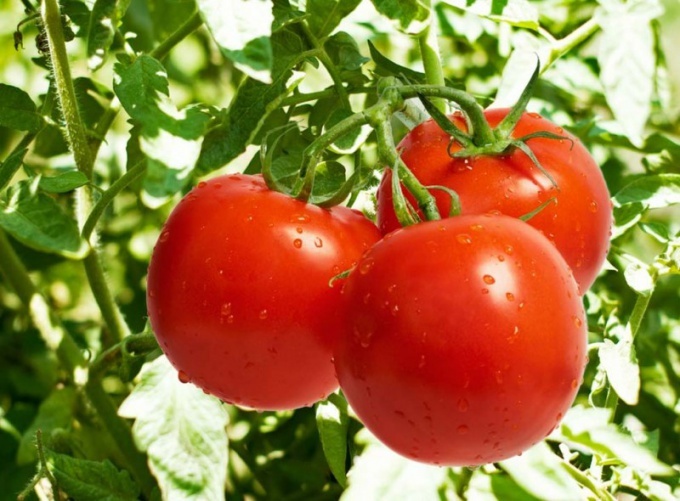 Pasynkovat tomatoes is recommended, primarily in areas with short summers, as well as in the cultivation of late varieties of tomatoes, with dense plantation and if the plants are going to increase at the expense of fruit set. When you remove side shoots of the plant can be formed in one, two or three stalks. In the first case on the main stem, remove all side shoots that have formed in the axil of each leaf, second - leave stepson, which was formed under the first flower with a brush. In the third case, leave the same stepson, and another one who is lower, but well developed. New shoots appear regularly on the tomato plants, so they need time to remove. It is advisable to do it with scissors, leaving a stump of about 1 cm. Pinched tomatoes is carried out if there is a need to limit the growth of shoots. With removed the top part of the fruiting escape. This procedure allows to accelerate the formation and maturation of the ensuing fruit. Depending on different factors such as plant variety, weather conditions or location of the district, the nipping is carried out over the 2nd, 3rd or 4th tassels. This procedure is especially important for late tall varieties. Simultaneously, remove all floral brushes that will not have time to form fruit. Will help accelerate the ripening of tomatoes and this technique, like turning the fruit to the sun. At the same time on the plant and remove all yellowed and dead leaves, and under sprouts with tomatoes put a wooden support. Thus, the sun will get to the tomatoes, which will cause the speedy ripening. If the Bush is well formed, but still unripe fruits, you can remove them in this state. This will help to speed up filling the rest of the fruit.